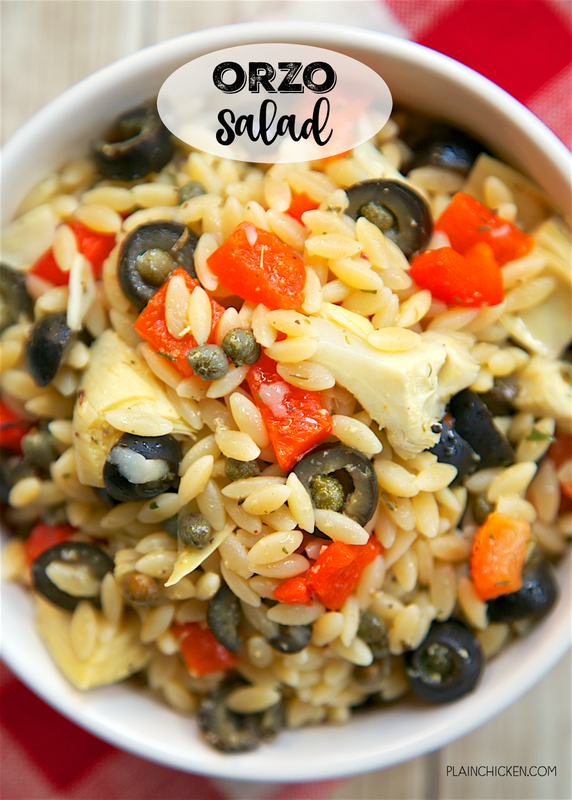 Orzo Salad - orzo, roasted red peppers, artichoke hearts, capers, black olives tossed in a quick lemon olive oil dressing. Can serve warm or cold. This is SO good!! It gets better the longer it sits. Great for cookouts and tailgates! Need a delicious side dish for your upcoming 4th of July cookout? 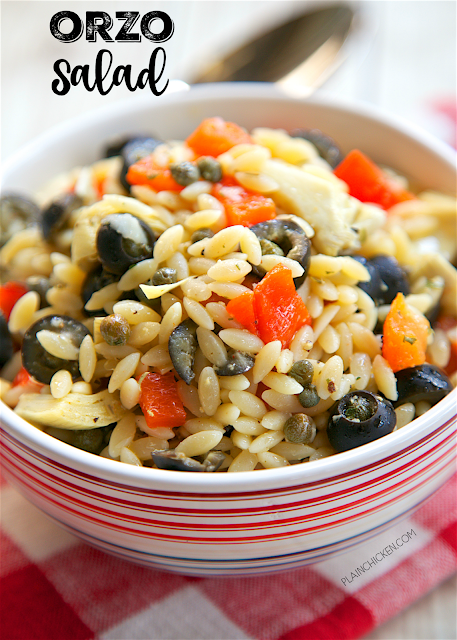 This Orzo Salad would be perfect! Orzo, roasted red peppers, capers, artichoke hearts, olives tossed in a quick homemade lemon olive oil dressing. SO colorful and super simple to make. It makes a ton, so it is great for a party. We served it the other day with some grilled pork tenderloin and it was perfect! This Orzo Salad can be served warm or cold. We ate it both ways and it was great either way. We actually ate it warm for lunch and cold for lunch the next day. It is one of those dishes that gets better as it sits. It has more time for the dressing to soak into the pasta and veggies. Give this a try at your next cookout. Everyone will thank you! Cook orzo according to package directions. Drain and transfer to large bowl. Mix in roasted red peppers, capers, artichoke hearts, and black olives. Whisk together olive oil, lemon juice, garlic, oregano and parsley. Pour over orzo and vegetables. Toss to combine. Serve warm or refrigerate for later. Thank you for such a beautiful all-purpose salad. If you were making it to be a cold salad only..would you switch to red pepper, celery, olives and any other crunchy type additions? Any other ideas? Thanks for all your tasty recipes.